I think I'll start this out by saying for the benefit of those who already know about the afterlength and tuning it, that with fine tuners, 54.5 and 55 mm are not at all meaningful when fine tuners are involved. At least not according to my own experiments. This is likely to be a long post (especially with even brief explanations) about violin adjustment, and might be too technical of a matter for most people's interest. There's the disclaimer. Now a word for those who have no idea what I am talking about.. The afterlength is the part of the string between the bridge and the tailpiece. Some very reputable violin folks say that those should also be in tune, though it is not as simple as them matching the strings because it is a much shorter piece of string. What I have usually seen said is that if you bow the afterlength of the D string, it should be in tune with the harmonic near finger 4 when your hand is in position 1, but an octave higher. Now you may wonder why that would be important. Well, it is supposed to have to do with how musical notes resonate through the bridge and nut and tailpiece and how one string affects the others when you play. But an easier point to understand would be that that little bit of string does vibrate when you play, and if it is not at any sort of musically related pitch, it may be a very sour note. It would be a much quieter note than the one you are bowing, but there would always be a little bit of sound from the afterlengths of all 4 strings there in your sound, so some folks tune those by adjusting the position of the tailpiece. For most people, I would say it is nothing you will want to mess with. Adjusting it requires many times the amount of work you'd do in say, changing a set of strings, since it likely will have to be done quite a few times to get it right. The pitches are high enough that some people might have some difficulty hearing them (or even playing them, if you haven't learned to play harmonics yet) and in my opinion most electronic tuners just aren't made to be accurate up in those ranges. The process itself isn't that hard and doesn't take any special tools or Harry Potter's magic wand or anything, but with taking the violin partially apart and then reassembling it and re-tuning it over and over, it would probably fall under that list of things most folks will prefer to just leave alone or ask a luthier about. Some people also say it either doesn't make a difference or that the difference is so slight in most cases that it isn't worth the trouble involved. It seems to be rather controversial so far as adjustments go. Just keep all that in mind if you ever decide to go ahead and try it, and don't say I didn't try to warn ye, ok? So anyway, I decided to tackle adjusting the afterlength of my electric violin. I had the bridge and 2 of the strings off anyway, because of my "tube elimination" project, and I had been meaning to get around to this adjustment on my electric, so it seemed like a good time. I ended up spending couple hours getting it even close, and then fussing with it on and off for most of the day and evening before finally getting it right. It took me longer than I thought it would because my fist adjustment, I tried adjusting the tailgut length to bring the afterlength to 55 mm, considering it to be the length of the string between the bridge and the ball end of the string in the fine tuners. That ended up being way too long, the afterlength pitch was several notes low. But still thinking it should probably be somewhere around 55 mm that I have seen mentioned, I walked it back up slowly. 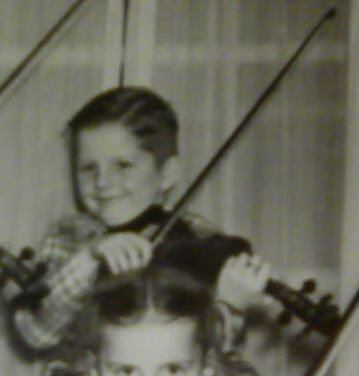 During all those retunings and etc, it was kind of like my violin was having a case of "multiple personality disorder". At some of the spots, the sound was very unpleasant. What string was loudest changed with almost every move, and the timbre of the instrument changed. Most of the differences were subtle, but some of them were glaringly bad. I didn't find any "magic" spot in the overly long lengths that actually sounded wonderful. Some of them were at least playable, even reasonable. But so far as those folks that don't think it makes a difference, well, it did on this particular violin, anyway. As I got close, I ran into another problem. The vibrations through the instrument got pronounced enough that the back plate started to rattle and buzz. On my electric, the whole back is one plate that is held on with small screws. After checking the screws to make sure they weren't just loose, I ended up taking the back off and padding the inside of it at spots where it might be buzzing against other parts with some thin craft foam. That fixed it, and I'll think of it as an upgrade in eliminating possible mechanical vibration where it isn't wanted. I finally got it to where the afterlength is in tune. Now a few days to let things settle and make sure I don't have to touch it up again, and I'll call it good enough. Since this adjustment does involve talking off the bridge and tailpiece, I'm not at all sure that it won't need another adjustment or two after it has had some settling and "play in" time. Now, back to that 55 or 54.5 mm that is considered the approximate "usual" measure of the afterlength. My experiment suggests that the number is not even close to right when using fine tuners. The distance from bridge to ball end of the string is measuring at about 43 mm. The distance to the "fret" of the bridge (where the afterlength would have been measured without any fine tuners) is closer to the 54.5 mm measure, being about 52 mm. I hypothesize from this that the tuners themselves may vibrate more like a string than they do like the bridge. 55 mm would be about halfway along the length of the "arm" of the tuner, and I see no mechanical pivot point or etc there to account for that. I suppose the important part would be whether or not I feel that the effort improved the sound. I'm hesitant to commit to an opinion on that just now, since I won't be sure the adjustment is exactly right until the instrument has been played for at least a few days to give a chance for all the parts to settle and to see if that requires more adjustment. It sounds *nice*, though. Nothing harsh or bad. But some things are a bit different about the sound and feel of the instrument. Vibration is more noticeable while playing, not only through the collarbone and jaw but also the thumb and fingers of the left hand. I can feel the vibration in the bones of the left hand and wrist, which I hadn't noticed before. That's not a bad thing. My favorite electric guitar (Gibson) does that as well. The instrument also has more of the odd "echo" quality. Playing it unamplified in a quiet room, at close range (like my ear) it sounds almost like it is being run through a slight reverb. Bow noise seems to be down a bit, and that only changed right when I got to the last adjustment and the afterlength tuning for the A&D strings got to "dead on". However!! This is an electric instrument. Even if the adjustment maybe improves the acoustic characteristics a bit, that is no guarantee that it will actually sound better when played as an electric instrument. Some schools of thought about electric instruments with piezo pickups view the acoustic properties of the instrument as something that should be kept to a minimum, because the very resonances that can sound good on an acoustic instrument can result in problems with desirable frequencies getting messed up by something called phase cancellation, that I won't go into here. (Not enough electric violin devotees to assume the readership here is likely to have many people interested in such technical points) But those folks claim that the best thing for an electric violin would be to have no acoustic sound at all, with all vibration just stopping at the base of the bridge where the pickup is and no sound happening in the body or neck of the instrument at all. I did this experiment because I don't necessarily agree with that. In my experience, if you take two acoustic guitars and put piezo pickups on them, the one that sounds best acoustically will usually also sound best through the piezo. In fact, if an acoustic guitar sounds crappy, then putting a piezo pickup on it and amplifying it usually just makes it sound even worse, just louder. I have yet to see a case where a guitar sounded like crap but was just beautiful through a piezo pickup. I think it falls under the old maxim, "Garbage in, garbage out". I can't really evaluate the electric sound yet, because I ran into another little problem. I made the preamp to work with the pickups at their previous output level. I adjusted the components in the circuit so that it would just barely edge into clipping/distortion if I played a note quite loud. Either the change in pressure or the increased vibration from this adjustment has changed the pickup output so that it is putting out enough to overdrive the preamp into clipping with anything but very light bow pressure and gentle bowing. So I'll need to open up the back and tinker on the electronics a bit before I can tell for sure. Theoretically, it could be a good change, though, since more output from the pickup would mean a better signal to noise ratio. But I won't know for sure until I tinker with that preamp a bit and tame down the gain levels to match the pickup's output at present. wow, I made it halfway through. Cant take it anylonger.......wow. WOW,,, I didn't finish either, but then again, most all of danny's post's are like reading a novel. A rule of thumb for distance from bridge to tail piece is approx. 1/6 the distance as from bridge to nut. Therefore, I took 3 of the fine tuners off because it says from bridge to tailpiece, not bridge to tuner's. I had to move the tail piece back about 3/16" to achieve this measurement. I don't think the average player is much concerned about the htz of the afterlength anyway. But at least I learned a new term today: afterlength. Now I'll have to find an opportunity to use it in a sentence. I'll try to keep the length down. I suppose it shows that in my usual "pay gig", I get paid by the word, huh? It was a really interesting post, Daniel. I would never have considered that the bottom part of the strings would possibly need to be tuned. I tried bowing them when I practiced tonight, because of this thread. It didn't really sound like much and I assume that I would be one of those who would never hear any vibration in the afterlength. It's fascinating to learn that some folks would pick up on that. Not surprisingly, I followed your every word AND understood every word. I agree 100% and the fact that you have achieved the results that I did shows there's much to be learned and understood in regards to tailpiece length of the string. On my k500 only the E string has a FT on it, the others are solid to the tailpiece with a ball/socket connection. If I were to change to all 4 being FT's then I would expect the sound to go the wrong way. Perhaps I should invest in some and prove the point you have already made from a different angle and with an acoustic model. As far as the vibrations is concerned, I found the EXACT phenomenon to be occuring when my violins were "right on" as far as bridge modifications were concerned. Also, if you play the individual strings just holding the violin by the peg box end of the neck and let it hang vertically, noting the sounds made will continue to resonate long after you have removed the bow, you have a good start on a perfect setup. If the strings stop almost immediately after removing the bow from them, you have a poor resonance setup and the resulting sound analysis trace I make will be far below it's best result. Oh how I wish I had access to a lab and the time to spend chasing these things that make me ask, "why?" Y'all are such geeks, and I mean that in the nicest possible way! "This is likely to be a long post (especially with even brief explanations) about violin adjustment, and might be too technical of a matter for most people's interest. There's the disclaimer." My goal with this topic isn't to write something that everyone will necessarily find interesting and fun. It is trying to document an experiment on a tuning that is sometimes considered a part of the setup of the violin. It is only likely to be of interest to folks who are trying to learn about how setup is done and why some parts of it are done or those who really wonder what effect the fine-tuners may have on such things. Of course, anyone who feels that isn't an appropriate topic in this section of the forum or who feels that too much detail or explanation are bad things can take it up with Pierre or just skip this discussion. @Fiddlestix: the 1/6 rule of thumb may have come about as a quick and easy way to approximate the right length for the afterlength to be in tune. The 54.5 mm often mentioned as the correct length for it when using a standard tailpiece with no tuners is just 1/6 of the 327 mm considered "standard" for the string length from nut to bridge. But those lengths are a harmonic relationship, and there is probably a reason for it. My hypothesis for this experiment was that a violin with fine tuners could still have the afterlength tuned, but the presence of the fine tuners would change the length needed to get that same harmonic/musical relationship. I don't think that three or four centuries ago when the modern violin developed that people cared the Hz of the afterlength either. But there was something they were after with making that distance what they did, and I want it. LOL The average player might not even be able to tell you the Hz of their G string. The Hz is just a number. But that doesn't mean it doesn't matter or that a difference in the Hz of it may not make a difference that can be heard. @KindaScratchy: It isn't really easy to get a note off the afterlength. It is very high pitched. To me it sounds more like when a string whistles than a real note, and there is a lot of hiss from the bow hair on the string when you bow it fast enough to actually get a note. I found it harder to get a good enough note on it to be able to hear the tuning than it is to play harmonics on a violin/fiddle, which also takes a bit of trying at first. So it probably isn't you, it actually is harder than getting a regular note. @cdennyb: Well, on the non-FT strings of your K500 there's a sort of a fret that appears to be made of ebony on your tailpiece. It is a well crafted instrument, and I'll bet that the non-FT strings are either already about 54.5 mm at that fret or very close to it. I can't think of any way that the afterlength tuning could be done for a mix of FT and non-FT strings. But I do begin to wonder if the difference the FT on the E makes is why so many concert players end up using a different brand or type of string on their E string. Different gauges, platings and construction all affect how a string acts harmonically and as such how it sounds. And yes, how long the sound sustains has increased by several seconds as a result of all this messing around. But it is not just vibration in the string, since when I play a melody I can hear some notes "echo" a little as I move to other notes. There's the usual bit of echo you hear if you play like a D note on the A string when the A string isn't being muted, but this is something different than that. Yeah, if I had all the time in the world and a lab, I could spend some centuries studying violins. LOL But my lab is a kitchen and about the most exotic test gear I can muster right now is the computer in my digital studio upstairs set up to work as an o-scope or doing some FFT analysis. And a lot of days, there just aren't enough hours in the day to tinker as much as I could wish. @dionysia: Geek isn't a bad word, at least not to me. Especially when meant in the nicest way. I get into this kind of stuff way more than most people. It is just part of the fun to me and one of the ways I enjoy the instrument and music in general. For a comparison that some folks here might get, but will probably be lost on others.. I make my own orange marmalade. I loved how orange marmalade tasted when I was a kid, especially when my grandma had made it. But the stuff I can buy in the store doesn't taste like even storebought marmalade tasted about half a century ago when I was very small. There are some really good brands that are closer, but they cost a lot and they still aren't quite what I want. It is just the way the world has gone. So to get the taste like I remembered, I had to learn to make my own. After I learned the basics of that, I spent a good bit of time hunting down an old copy of the cookbook my grandma had used so I could find out at least the basic recipe she probably started from. It took me a few years, and it took making some mistakes as part of the learning process, but I eventually got to where I can make a batch of marmalade that is just oranges and cane sugar and fresh squeezed lemon juice and water that tastes a lot like it did when I was a little kid. It is at least darned close to as good tasting as what my grandma made. The funny part is that it costs less than most people probably pay for even the cheaper storebought stuff. But learning how to make it so I can make it myself lets me enjoy a quality that is far higher than what I would pay for marmalade. It is a quality of life thing. Those that can understand that will understand. To others, well, maybe they want something different. It is a big world, with room for lots of different viewpoints. Anyway, back to the experiment..
My electric violin seems to be stable on the afterlength tuning. It seems to be re-settling, and I am liking what I hear and feel from it. The sustain is up, as cdennyb mentioned. The tone is different, but I don't want to go too much into subjective stuff on that until I am sure it has mostly settled. One thing I can say is harmonics are much easier to play and ring clearer. This instrument used to be a little dead in that regard and only liked to play "easy" harmonics. Where one bows between the fingerboard and bridge makes more of a difference on the sound timbre than it used to. Any time you mess with this sort of thing on an instrument, there is a chance you will like the result better. Obviously, you also may not like the end result as well. It is a gamble. Yesterday I wasn't so sure as I liked the result better, though it still sounded good. Today I am more sure that the results were worth the work to me, and that confirms my suspicion that the instrument would need to resettle a bit after this sort of an adjustment. But so far, so good. Daniel - This got me to laugh pretty hard. Almost anytime you write a post they are very long, but I love reading them. Thanks for taking the time. I ususally have to check the time before reading a Daniel post LOL. Why is that Terry? ... cutting into tea time? I had to pack a sack lunch when I started on the second novel, errr.... post. When I have something to post, it usually starts out that long in my head but it gets shortened due to my lack of focus. I actually had something useful to respond to, but I've forgotten it. @KindaScratchy: You might even have gotten the note when you tried bowing on the afterlength and not known it, since it sounds kind of odd compared to a regular note as we'd usually play. It is also quieter than most notes we'd play usually. I recorded it for you and amplified it a bit to make it easier to hear. Well, y'know boys.. you can laugh about my posts sometimes ending up a bit long. I really don't mind, and laughing is good. But being able to write some length is a marketable skill, and as you might have seen me mention in my interview, it is one that I do bank on. Not everyone can do it, some people have trouble writing even just a few hundred words. Here I'm just writing about violin topics that interested me enough to do some experiments on in the hopes that it may be of interest to a few or maybe save somebody else a bit of work someday. Now some observations on the affects of having tuned the afterlength and about fine tuners. The afterlength tuning does seem to result in some "sweet spots" on the fingerboard, where normal notes and playing techniques get a bit more "feel" or have a bit more sympathetic ringing with other strings. So long as the fine tuners stay fairly close to where they were when it was tuned, those sweet spots mostly seem to fall right where you'd usually play notes. Adjust the tuner too far though, and the sweet spot may move too far off the place you have to put a finger down to play the note with acceptably proper intonation. It does not just affect open strings. If you are holding down more than one string to play like a series of notes across 2 or more strings where it is just simpler to use your finger sort of like a guitar "capo" on 2 or more strings, they are affected and you can get some "echo" from the strings not being bowed at the moment that can be in tune with what notes you are playing. If you play to that intentionally, you can get some nice sounds that way. My current theory is that the resonance/reverberation through the bridge/nut/tailpiece between the strings is part of the desired sound of a violin and that the 1/6 rule of thumb evolved as a way to get at least close to the right resonances so that when reverberation occurs through the instrument, it will be musical rather than just random. Violins with fine tuners can still do it, but you want to have the tuners about in the middle of their adjustment range when tuning the afterlength. They can still be used for fine tuning without there being enough change in the "sweet spots" to make the player have to choose between the "echo" and getting the right note, until you get near the extremes of their tuning range. At that point the string length has been changed enough that the afterlength tuning isn't right or even close enough to be used anymore. Of course, that would not be a concern on violins that don't use fine tuners, where afterlength would be a "set it and forget it" part of setup unless the player makes a drastic change in strings or possibly if the bridge were to be changed enough. Doing this on an electric violin has been interesting since it pretty much lacks anything like the wooden soundbox of an acoustic violin. It has less parameters involved in how the sound is being amplified (the soundbox of an acoustic violin is in effect an amplifier), and so some things may be easier to notice. I would have to conclude that the best fine tuners would be the ones built into the tailpiece. I had a violin with an aluminium tailpiece but didn't much like the appearance of it. In changing it to an ebony tailpiece, with 4 conventional fine tuners of our day, the violin lost some of it's brilliance. If I could find a tailpiece with built in tuners that wasn't ugly I would consider using them on my violins. Possibly a composite with a fleur-de-lis inlay or better yet NY, the Yankee's emblem. I have an ebony tailpiece right now with a gold rose inlay with one gold fine tuner. I love to read your post but I also love to kid you about them. Sorry if I have offended you in any way. Nah, no offense taken and I hope none given, Kevin. The fine tuners built into bridges work by the same principle, basically stretching or relaxing the string a little, so I think they'd have the same problem, really. But standard add-on tuners have the added problem of sometimes vibrating loose. I noted two of mine were loose then I took the tailpiece off to adjust the length. But I think the locktite will remedy that for a good long while. Hadn't noticed it though, since because they are always under tension they hadn't acted loose. I'm working with crap quality parts here, though. There may be some better fine tuners out there that I have never even seen yet. But one way or another, the only ways I know of changing the tune of a string are to change the length or the tension (and one affects the other at least somewhat). Well, or one can change the material of the string to some effect. The material a string is made of or wrapped with as well as the thickness will affect tune and how it vibrates. I kind of wonder if i am going to need to touch up the afterlength again when I replace the strings with ones that aren't getting rather dead and worn. But if I do, that should be a far more minor adjustment. Same here Daniel, I read all your posts but it doesn't stop me having a little joke with you now and again. I do the same to DennyB, another of my favourites ( even though he doesn't like being inferior to Brits!